Sounds great, a chocolate calculator but the only probem with that would be what happens when you eat some of the numbers? 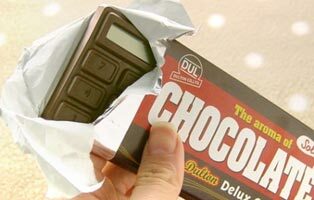 So of course it is not a chocolate calculator, it is however a calculator that looks like a nice bar of chocolate, it is even wrapped up similar to a real bar of chocolate, so there is bound to be a few accidents if we ever see it over here, so you have been warned. There is no doubt that novelty gadget items are increasingly appearing and why not, this calculator does look real, it is only upon opening the realistic packaging that the calculator is revealed, it might be a good give away for the those who join slimming clubs, you can just imagine someone on a diet having the craving for chocolate, ripping into it only to find that it is not what it first appeared to be, maybe there should be a government health warning on the packaging somewhere, just in case! The calculator measures 4.3” x 2.4” x 0.3” which is a pretty tasty size, to save energy it is solar powered, and is supposed to have a real chocolate scent to it, a calculator that smells like chocolate, how about that! This could go down as the most wicked present ever, all those chocolate lovers ripping into the packaging only to find out that they have a calculator and to be fair this is not really a practical calculator at all, by looking at the buttons the functions are limited, but for only $4 (£2) this is novelty gadget and a very funny one at that. 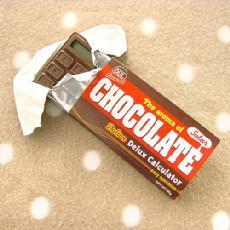 HOW CAN I PURCHASE A FEW OF THESE CHOCULATORS???? WHAT WEBSITE OR PHONE# CAN I CALL TO PLACE AN ORDER??? You can buy this on e-bay for $1.00 i have 4 and they are the best although some of them don’t work to well. I recommend that you buy it from E-bay as it is a lot cheaper and you get a free (REAL EDIBLE) chocolate bar with it! I hate math but i love chocolate!